When Commonwealth Care of Roanoke (CCR) began to see patient acuity levels rising in its post-acute and skilled nursing centers, the company knew it needed more baccalaureate-prepared nurses to meet the challenge. The nursing shortage made it difficult to recruit these professionals, however, especially in some of the rural areas CCR serves. So the company hit on an innovative solution to the challenge: It partnered with Madison School of Healthcare to help its existing nurses earn degrees in the college’s RN to BSN completion program and to provide a recruitment incentive for attracting new nurses to the staff. We recently sat down with Lora Epperly, Director of Business Development for CCR, to learn more about why the company chose to partner with Madison School of Healthcare and what benefit they’re seeing from it. Q: Tell us about CCR. What services do you provide? 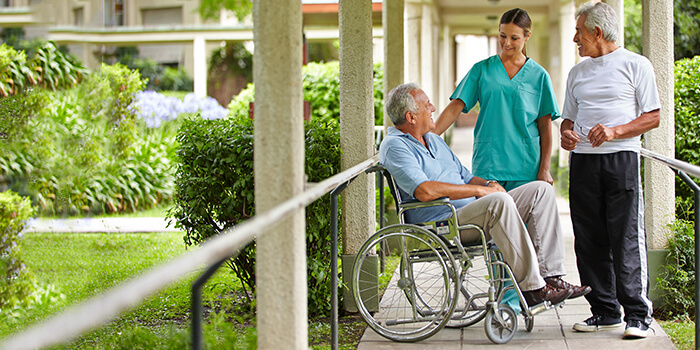 A: CCR has 12 skilled nursing centers across Virginia that primarily provide rehabilitation care and long-term care. We pride ourselves on the quality of care we offer and our community involvement. We’re very committed to serving the people of Virginia with compassionate, evidenced-based care. Q: How have the workforce issues surrounding nursing affected CCR? A: We’ve seen two particular issues emerge. First is that the complexity of our patient population has risen considerably, especially in our short-term rehab programs. Many of these patients come to us from the hospital still very sick. In some ways, our short-term rehab facilities now must function more like a med-surg unit in an acute care hospital. So, that’s one thing. And then the other workforce issue we’ve faced is that we realize the value of the baccalaureate background for nurses, but many of the nurses we recruit are associate degree nurses (ADNs). Q: When you say you recognize the value of the baccalaureate nurse (BSN), what do you mean, exactly? A: Well, let’s be clear that ADN nurses provide equally skilled, compassionate care. But what we have seen with BSN nurses is their ability to practice with a degree of independence, due to their assessment and critical thinking skills. The ability of nurses to function somewhat independently is important because unlike a hospital we don’t have a doctor in attendance at all times. So, we rely on our nurses to make very sound assessments and notify a doctor if a patient needs care. Q: That makes sense, because BSN programs tend to focus on developing those leadership skills that empower nurses to function at a high professional level. A: Yes, and that brings up another point, which is we have regulatory issues regarding how we deliver care. LPNs (licensed practical nurses) used to run the rehab and skilled nursing units, but now we routinely admit patients who have chest tubes, trachs, peritoneal dialysis – that sort of thing. LPNs cannot, by regulation, assess and plan the care of these very complex patients. We needed more RNs to run the units, and what we found was that the baccalaureate nurses had both the clinical skills necessary to manage that level of patient complexity and also the leadership skills to guide the team. Q: So you wanted more BSN nurses and wanted to provide a mechanism for your current ADN nurses as well as new ADN staff. Is that why you partnered with Madison School of Healthcare? A: Yes, definitely. We currently provide clinical sites for other nursing schools, and we saw the opportunity to partner with Ashworth College/Madison School of Healthcare as a way to accomplish the goals of more BSNs and of being able to offer our nurses and recruits a way to accomplish a BSN. So many aspects of the RN to BSN program at Madison School of Healthcare fit with what we were looking for: the flexibility, the cost, the ability of staff to join at any time. It made it easy for our nurses to fit BSN completion into their work life. Q: Several of your nurses are currently enrolled in the BSN completion program. Have you seen any benefits from this partnership yet? A: We are able to retain staff because of this. So the return on investment is already there. Q: Really? Have you actually had nurses tell you they’re staying with CCR because of your partnership with Madison School of Healthcare? A: Let me tell you a story. We have an ADN nurse in a very rural area of Virginia. She is very committed to our company, and one of her professional goals was to obtain her BSN and eventually her MSN. Through our partnership with Madison School of Healthcare, she started the BSN completion program, and now she has said she is already planning to pursue her master’s online, too. Obtaining these degrees will place her in very good position to advance into leadership positions at CCR. She won’t have to leave our company in order to advance her career. Q: That’s fantastic! A great success story. A: Yes, we’re very happy with this partnership so far. Q: When you took the proposal to partner with Madison School of Healthcare to your corporate leadership, were there any concerns about the quality of education, since the program is online-only? A: No, absolutely none. All universities today, including schools like Virginia Tech, are very into distance ed and online learning. Especially in the rural areas of our state, online education is an accepted method of learning, so we had no issue at all with the nature of the Madison BSN completion program. Q: What would you tell another healthcare organization about a partnership like the one CCR has with Madison School of Healthcare? A: I would say that nurses need to feel respected and be recognized for their efforts to pursue more education. We already encourage nurses to get certifications and complete continuing education, so why not give them an opportunity to complete their BSN? It just makes sense. Our thanks to Lora Epperly of Commonwealth Care of Roanoke for sharing her thoughts about the business value of the company’s partnership with the Madison School of Healthcare.